The Farming Today program on BBC Radio 4 on Wednesday covered moorland management (it’s available Link as a podcast for 28 days). On it was a representative from the Moorland Association who said that rotational burning of grouse moorland had been “voluntarily suspended”. If you are not aware, rotational burning is the practice when our heather moorlands are deliberately set on fire in order to encourage fresh shoots of heather with the sole purpose of maximising the grouse population for shooting. There is serious scientific evidence that burning such as this seriously degrades the protected habitats of our uplands by drying out the thick peat thereby increasing the risk of wildfires. Carbon, which has taken millennia to accumulate in the deep peat, is released into the atmosphere and the risk of flooding downstream is increased by making the moors less able to retain rain runoff. The European Commission recognised this as a serious degradation of our moorlands and launched an investigation. To avoid upsetting wealthy landowners the Environment Secretary Michael Gove came up with a cunning plan. 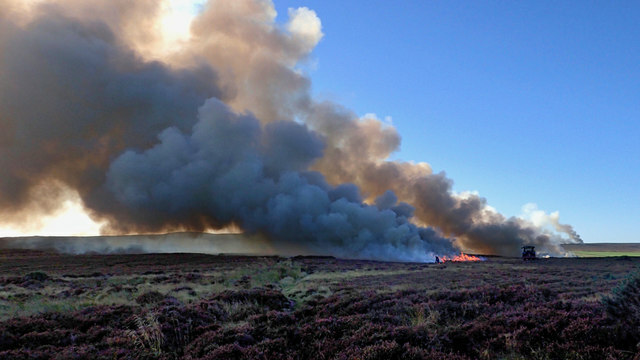 Instead of banning or regulating moorland burning he dreamt up a scheme by which landowners signed up to a voluntary pledge to cease rotational burning. It is evident that not all landowners intend to sign up to Mr Gove’s scheme. This is on Stanghow Moor today as seen from the A171 at Birk Brow. In the far distance are further fires which I believe are on Codhill Heights owned by Guisborough Estate. (A drone photo on the Guisborough FaceBook page confirms this.) Should the government continue to allow this practice of burning then it faces legal action by the European Commission. Until we actually leave the EU of course then we can do what we like.